Stair Solution is hosting a free lunch and learn workshop this Saturday, May 13, 2017! 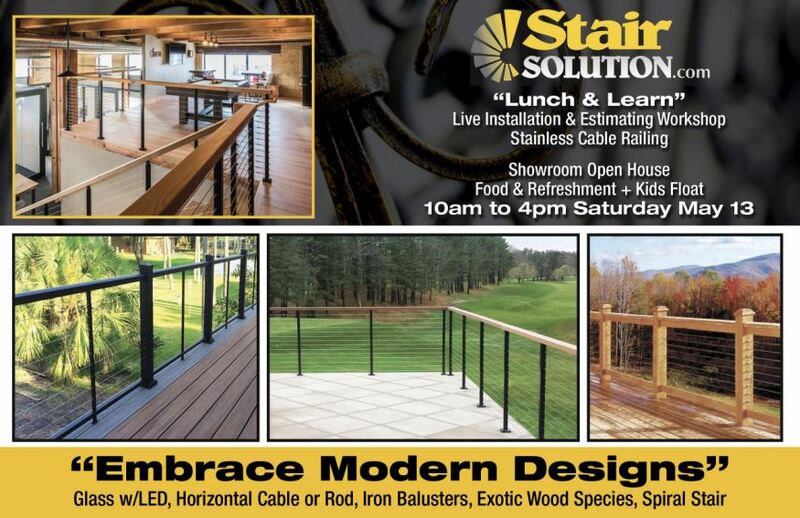 Come on out, grab some lunch on us and let us demonstrate live installations for our exterior cable railing products. Need a take-off to measure for stair parts? Is framing complete? While we do regularly work with home owners, we’ve also been partnering with local builders since 2003. This little known fact is just another way we at Stair Solution differentiate ourselves from our competitors. By offering our staircase construction services to builders, we achieve long-term relationships in the construction community and we all know word travels fast in this industry. Our licensed and insured team of installers can help bring new construction to life quickly and affordably. Our build-out process is suited for any residential or commercial builder, and we’re successful with it because we understand more than just stairs. We understand time and convenience. So by pre-staining our materials and handling 90% of prep work in our warehouse, we reduce build-out time from weeks to typically 1-2 days. This brings a high value to our builder partners because we understand the clock is ticking. We also welcome the Builder and GC community to visit our beautiful Alpharetta, GA product showroom which is one of the largest in the Southeast. Our hands-on owner, Mike Keenan is almost always at the showroom or in the warehouse helping with production and operations. Or if you can’t make it out, please check out our virtual showroom (here). We are also members of The National Association of Remodeling Industry (NARI) as well as The Atlanta Home Builders Association (AHBA). We have exhibits at both the Atlanta Home Show and annual Builder’s Show. We believe in supporting and working with local businesses for almost any opportunity that arises. We pride ourselves by being the only Stair Part Supplier in the Southeast with a centralized Alpharetta location, beautiful Showroom/warehouse and a ‘buy online’ eCommerce website. By offering this to our builder partners, we hope to reduce time and worry and help create lasting relationships in our industry. If you are a builder, a General Contractor or property owner and don’t know us yet, we urge you to reach out to us for any commercial or residential staircase, railing, or space saving needs.